If you’re a Brisbane local, you’ll be well aware that it’s been rather wet recently. When you’re out and about driving in rainy weather, visibility is already reduced by the rain. There’s nothing worse than flicking on your windscreen wipers to see better as you’re cruising down the highway or in heavy traffic, only to have them leave dirty streaks across the glass so you can’t see anything. Most people don’t give much thought to their windscreen wipers until they fail them, and many don’t realise just how often they need to be replaced. In order to work properly, the blades need to be making full contact with the surface of the windscreen. Once they’re started to wear down, this doesn’t happen, leaving you with a dirty, streaky, and overall hazardous line of vision. Depending on the climate where you live and how much use they’re getting, wiper blades should be replaced approximately every six to twelve months, or as soon as you notice a difference in how they’re performing. If your wipers are leaving streaks or smears across the glass, they probably need to be replaced. This often happens as a result of the rubber squeegee drying and hardening, so even if it rains infrequently, this can still happen. Don’t just turn up the radio to drown out this noisy problem. 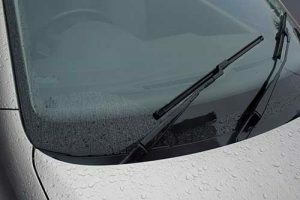 Skipping, shuddering, and squeaking is caused by the wiper blades making inconsistent contact with the glass, and can be the result of underuse or bent wiper frames. Cleaning your windscreen every time you fill up with petrol. This helps prevent the build-up of dirt and oils which can damage the blades over time. When you wash your car / windscreen, don’t forget the wiper blades. Give them a gentle wipe down with a paper towel to remove any dirt and oil. Never use your wipers to defrost your windscreen, as this can cause them to bend and even break. Keep your wiper water topped up. We don’t recommend using wiper fluid, as it promotes the growth of algae which can cause blockages. Your windscreen wipers are as essential to your car as good tyres and fresh oil, so be sure to regularly inspect them and have them replaced when needed to avoid poor visibility and potential damage to your windscreen.